Are you in the marketing for a very energy efficient hybrid car? The 2016 Toyota Prius 3 just might be the car for you. With mileage of 54/50 you are sure to save loads of money each year in gas. With a base price of just $24,200 the Prius 3 is sure to please and be easy on the wallet. Includes a Smart Key Fob which means a wonderful push start button in the car. Making it easy to leave it in your pocket or purse and still be able to start your car. You might notice no dashboard display? Look below! One thing that surprised me about the Prius is that the display was all up above the stereo in the middle. In the middle of the dashboard. NOT right above the steering wheel! This Prius has come a long way since 2015. I was pleasantly surprised by the whole interior and I LOVE the 2 tone white/black! VERY sleek! So much legroom for a compact car like the Prius! 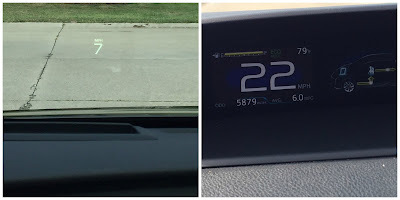 Heads up Display shows right on the windshield over the steering wheel, it JUST shows the speed. It also shows the speed limit when you start to take off on a main road. Lots of trunk space with the seat up and down. Also a cargo net which is perfect for groceries! 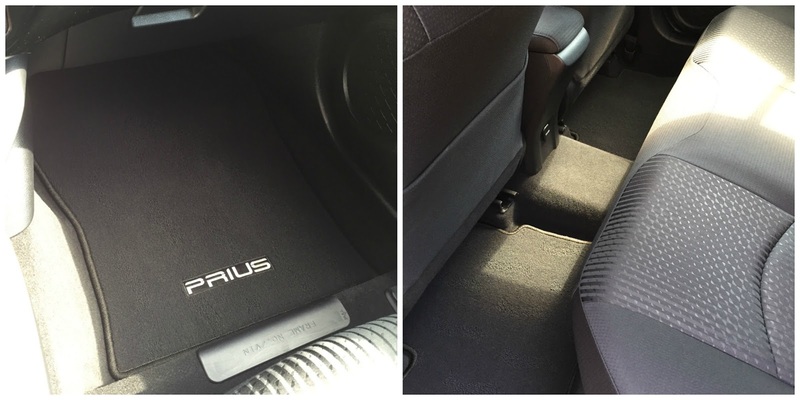 Overall I was extremely shocked at the space the Prius provided. Plenty of leg room in the front and back. Lots of storage space in the trunk and the storage in the front was very large too! It was also a very smooth and quiet ride. Even when the engine actually kicked on, it was still quiet and smooth running. Lets touch base on some of the safety features of the Toyota Prius. They have recently introduced Toyota Safety Sense, it is an active safety package that includes; Pre Collision System, Pedestrian Detection, Lane Departure Alert with steering assist, Auto High Beams, and Full Speed Dynamic Radar Cruise Control. 7 Airbags throughout the vehicle, Tire Pressure Monitoring and more! Overall I would definitely recommend the Prius 3 for anybody looking for a fuel efficient car that is perfect for everyday needs. *Disclaimer, I received a Toyota Prius for a week long test drive. All opinions here are 100% my own and I was not compensated to write this post, other than receiving the vehicle.